Working load limits are based upon static or moderately dynamic lifting/pulling operations. It is impossible to make blanket recommendations about working loads for fibrous and wire rope, given the wide range of use and the degree of risk to life and the property involved. However, to provide guidelines, working loads are tabulated for rope in good condition with appropriate splice, in non-critical applications and under normal service conditions. All chain, cable, fibrous and wire rope are sold subject to the following warnings and cautions, and with the express understanding that the purchaser and/or user is thoroughly familiar with their proper use. 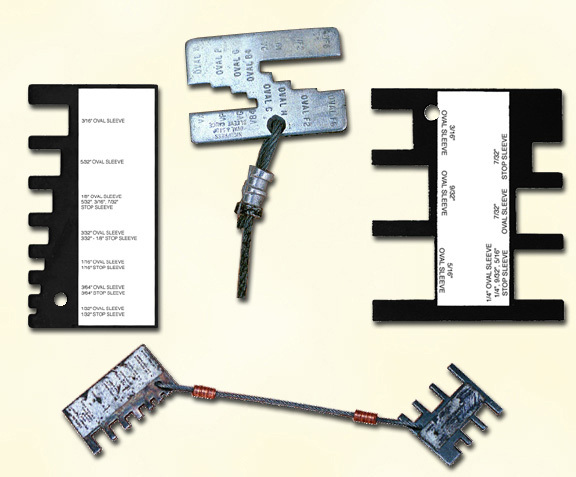 Sapsis Rigging, Inc. assumes no responsibility for the abuse, misuse or misapplication of these products. The Working Load Limit is the maximum load which should ever be applied to the product under any condition. The working load limit is based on static or moderately dynamic lifting/pulling operations where a load is being applied uniformly in a straight-line pull. SRI uses a 7 to 1 ratio to develop working loads in all critical applications. The Breaking Strength is an average figure arrived at by testing samples under laboratory conditions in straight-line pulls with consistently increasing loads to see at what point they would break. DO NOT use breaking strength for design or rating purposes; use work load limit instead. Sudden changes in load, up or down, in excess of 10% of the line's rated working load, constitutes a hazardous shock load, and would void normal working load recommendations. Whenever a load is picked up, stopped, or swung, there is an increased force due to dynamic loading. The more rapidly or suddenly such actions occur, the greater the increase in force. in extreme cases, the force-out on the rope may be several times the normal load involved. Therefore, in all such applications such as towing lines, lifelines, safety lines, climbing rope, etc., working loads as published do not apply. All attachments used with chains, fibrous and wire rope must be of suitable material, type and strength to provide adequate safety protection. Attachments should have working load limits at least equal to the other components with which they are used. "Proof Test" refers to a quality control test applied to the chain to check for material or manufacturing defects. A Proof Test Load is the load which the products withstood without deformation. This Proof Test Load is normally twice the Working Load Limit of the chain. The test is conducted under lab conditions where an increasing force is applied to the chain in a direct line and at a uniform rate of speed. 1. Turn back the specified amount of rope from the thimble. Apply the first clip one base width from the dead end of the wire rope. Place the U-bolt over the dead end; the live end rests in the clip saddle. Tighten the nuts evenly to the recommended torque. 2. Apply the next clip as near the loop as possible. Turn on nuts firm, but do not tighten. 3. Space additional clips, if required, equally between the first two. Turn on nuts, take up any rope slack, and tighten all nuts evenly to the recommended torque. 4. Apply the initial load and retighten the nuts to recommended torque. The rope will stretch and shrink in diameter when loads are applied. Inspect the clips periodically and retighten. Recommended torque values are based on the threads being clean, dry and free of lubrication. IMPORTANT: Failure to make termination in accordance with instructions, or failure to check the recommended torque periodically and retighten, will cause a reduction in the efficiency ratings of the clips. Important: Angular lifts greatly reduce the working load limits. Cable swaging is much easier if the cable is cut clean without frayed ends. Keep the jaws of the swager at right angles of the sleeves, making sure that the sleeves are aligned in the jaw grooves. Then close the handle of the swager completely. Sleeves elongate after compression. To assure maximum holding, allow the end of the cable to extend beyond the sleeve after it is compressed. 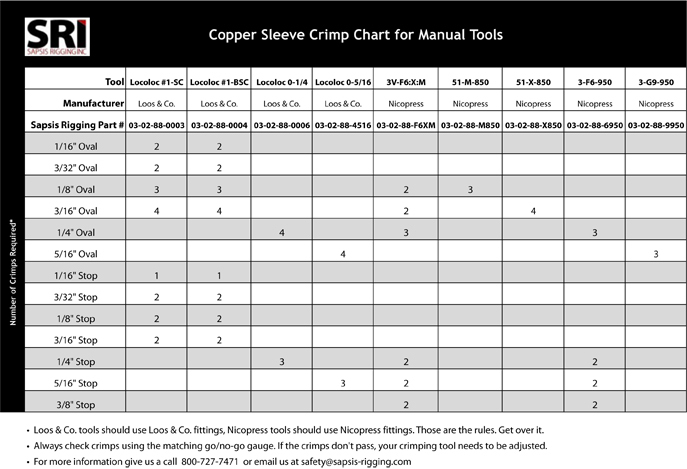 This chart shows the recommended number of compressions for each size and type of sleeve to obtain maximum holding. Each SRI swaging tool comes with a Go/No-Go Gauge.Use this gauge to check the accuracy of your swaging tool, then adjust accordingly. Select the slot in the gauge corresponding to the sleeve size being compressed. The compressed portion of the sleeve should easily pass into the slot. If it does not, then adjust your swager. Swaging tools should be cleaned and lubricated periodically, and bolts should be tightened. Working Load Limits in Lbs. Fibrous and synthetic rope, wire rope and cable must be inspected regularly. No product, even when used in the proscribed manner, can function forever at its rated capacity. The end user must inspect the product frequently for any condition (abrasion, abuse, negligence, normal wear and tear, etc.) which, should the product be left in use, might result in its failure. Working load is based upon static or moderately dynamic lifting/pulling operations. Instantaneous changes in load, up or down, in excess of 10% of the sling's rated working load constitutes hazardous shock load, and would void normal working load recommendations. All slings should be inspected by a competent person prior to each service lift. An inspection logbook should be maintained showing date of inspection and name of inspector. 1. Lay the sling on a flat surface in a well-lit area. 2. Examine the sling over the entire length on all sides. 3. Do not subject polyester roundslings to high heat. Permanent damage to a polyester roundsling begins at 190¾ F .
4. If the core of a polyester roundsling is visible, remove the sling from service. 5. If there are kinks or broken strands in a cable sling, or if the thimble is damaged, broken, or missing, remove it from service. 6. When removing a sling or roundsling from service, cut it into short pieces to prevent unauthorized use. These products are not designed or recommended for use in the entertainment rigging business, but are offered as a service to our customers who indulge in climbing or similar recreational activities. It is the responsibility of the end user to be properly trained in the inspection, maintenance and use of these products. The products listed in the Leisure section of our catalog do not meet OSHA requirements for Fall Arrest Systems and must never be used in a Fall Arrest System. Ask Uncle Bill, or better yet, have Uncle Bill ask you! Sometimes the most important questions are the ones we forget to ask.